The legalization of marijuana is the next great reversal of history. Perhaps the most demonized substance in America, scientifically known as Cannabis sativa, simply a very fast growing herb, thrived underground as the nation's most popular illegal drug. Now the tide has shifted: In 1996 California passed the nation's first medical marijuana law, which allowed patients to grow it and use it with a doctor's permission. By 2010, twenty states and the District of Columbia had adopted medical pot laws. In 2012 Colorado and Washington state passed ballot measures legalizing marijuana for adults age 21 and older. The magnitude of the change in America's relationship to marijuana can't be measured in only economic or social terms: There are deeper shifts going on here - cultural realignments, social adjustments, and financial adjustments. The place of marijuana in our lives is being rethought, reconsidered, and recalibrated. Four decades after Richard Nixon declared a War on Drugs, that long campaign has reached a point of exhaustion and failure. The era of its winding down as arrived. 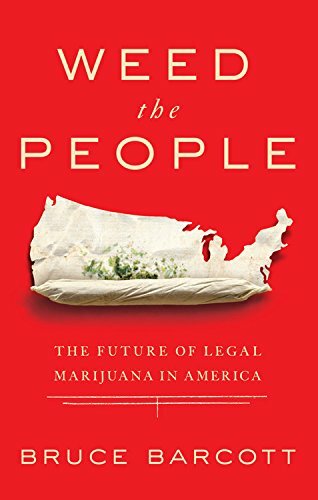 "Weed the People" will take readers a half-step into the future. The issues surrounding the legalization of pot vary from the trivial to the profound. There are new questions of social etiquette: Is one expected to offer a neighborly toke? If so, how? Is it cool to bring cannabis to a Super Bowl party? Yea or nay on the zoning permit for a marijuana shop two doors down from the Safeway? Plus, there are the inevitable conversations between parents and children over exactly what this adult experiment with marijuana means for them.